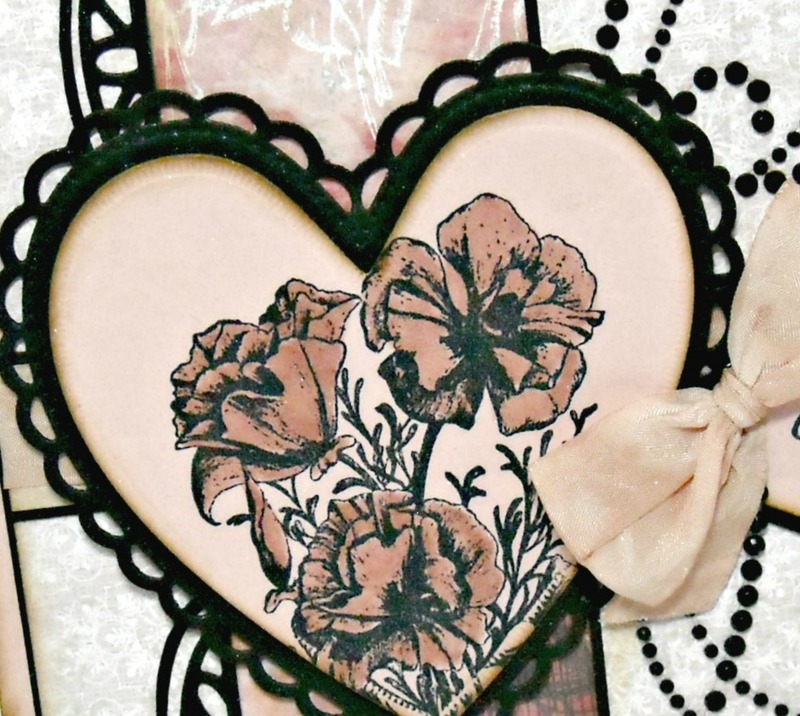 With Valentine's Day quicky approaching, I used North Coast Creations Floral Sentiments 3 stamp set along with Our Daily Bread Designs Heart and Soul Paper Collection and Custom Ornate Hearts, Beautiful Borders Dies and Recipe Card and Tags Dies to create a Valentine card. 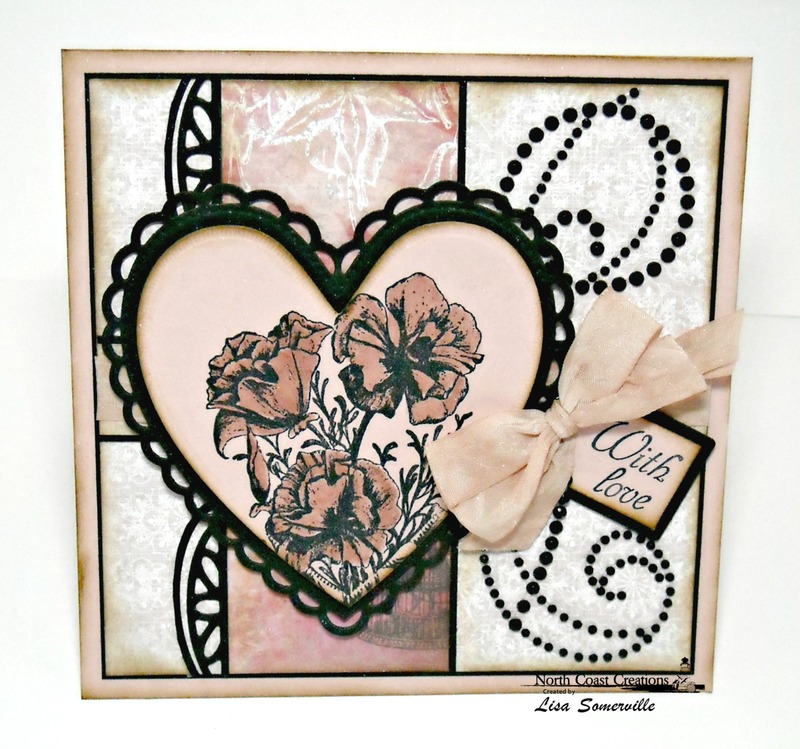 The floral image is stamped in Ranger Black Archival on Blush card stock, colored with STAEDTLER Karat Aquarell Watercolor Markers and die cut and embossed using the ODBD Custom Ornate Hearts Die. I sponged the edges with Gathered Twigs Ink, then layered it onto the Black panel that was die cut and embossed using the Custom Ornate Hearts Die. I used a SAMJ to stamp the sentiment so that it would fit nicely on the tag. I altered the ODBD Custom Beautiful Borders Die, by cutting away the "fringe" portion of the die cut. To embellish I added a Vintage Seam Binding Bow and Zva Creative crystal gems. This is so gorgeous and vintage-y! LOVE it Lisa! Love your shabby chic style. Looks like an antique valentine. Very pretty, Lisa! Love the soft blush color and gem swirls. Great card, I love the subtle feel of vintage lace you've achieved here! Thanks for joining us for this week's Simon Says Stamp Monday Challenge! You really teamed up the OBD hears and the NC stamps into one beautiful project GF! That's so pretty, Lisa, very elegant! What a beautiful vintage design Lisa!! I just love the roses inside the heart and the pink with the black. Thanks for supporting the challenge this week!! You are the best at vintage styles! I love the colors you chose to pair with the black.....super gorgeous design!! So soft and pretty. I love the contrast between the pinks and the black. Thanks for joining us at The Card Concept this week. this is gorgeous, love all the fabulous elements, the roses on pink how beautiful. thanks for playing along with us at Shopping Our Stash for the Love/Valentine challenge. Absolutely stunning! A beautiful creation that captures both the color challenge and the shabby/chic style perfectly! Love your perfectly tied bow!!! Oh this is so lovely! What a stunning bouquet of flowers and I love the blingy swirls! Thanks for joining us at The Card Concept!